If Rome is the city of stray cats, then Bankok is the city of stray dogs. Poor doggies are roaming around everywhere! The only exception to this appears to be the buddhist temples. There, cats are the norm. 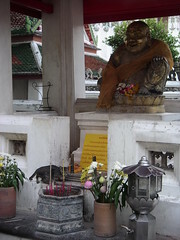 There were cats all over Wat Pho. I came by this shrine again later and found two ladies praying with the cats walking around their feet.